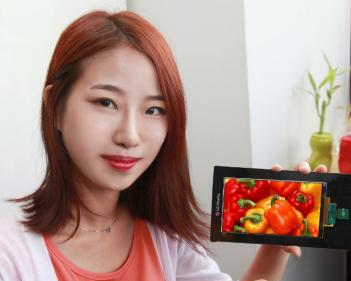 LG Display developed the world's first QHD (2560x1440) AH-IPS LCD panel for smartphones. This 5.5" display is the world's highest resolution mobile display and is features the highest density (538 PPI). LG says that this is also the world's thinnest mobile LCD at 1.21 mm. They say it's 12% thinner than LG's previous world record announced just last month. Something does not add up as the previous panel was 2.2 mm thick... so maybe the real thickness of this new panel is about 1.9 mm. Anyway, I'm not sure anyone needs such a high resolution and density in a mobile device, but this is quite an achievement by LGD. Still OLEDs a much thinner: a 6" Full-HD glass based OLED will be only 1.5 mm thick while a plastic-based AMOLED will be only 0.5 mm thick. MicroOLED announces the world's highest density OLED Microdisplay - 5.4mp on 0.61"